Home › Electronics › [Apple Mfi Certified] Ggmm M4 Leather Wireless Wi-Fi/Bluetooth Portable Outdo..
[Apple Mfi Certified] Ggmm M4 Leather Wireless Wi-Fi/Bluetooth Portable Outdo..
[Wi-Fi/Bluetooth/Aux]: Connect directly to your Wi-Fi network for Internet radio, your music library and favorite online streaming music services like Spotify, Pandora, and iHeartradio. Connect via Bluetooth, direct Wi-Fi, Wi-Fi router, or AUX. Easily switch among separate audio sources and add up to 16 devices without disconnecting.Wi-Fi working over 160 feet. 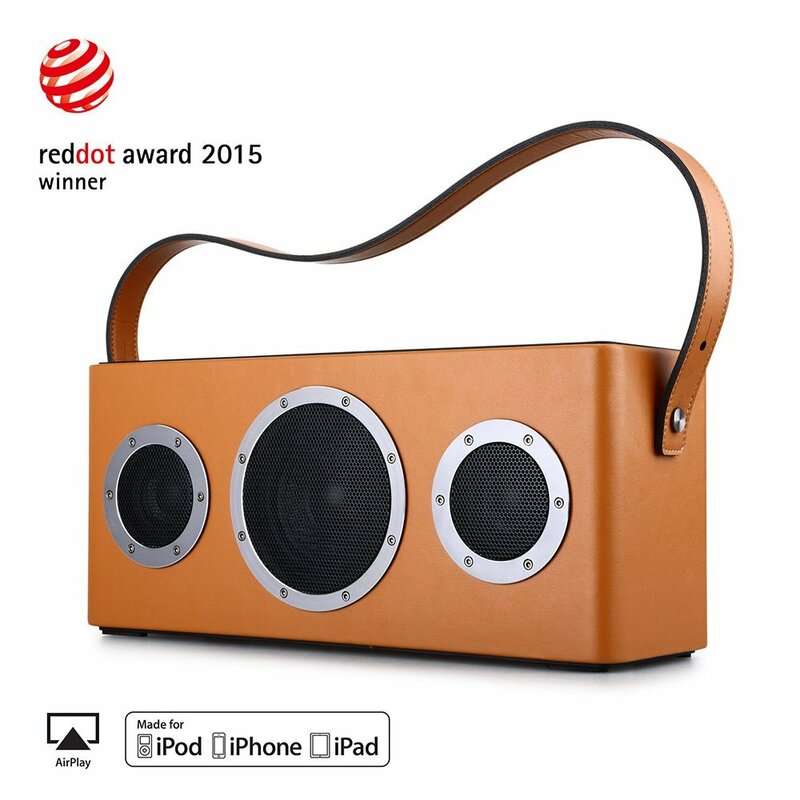 [Reddot Winner]: Reddot award winner in 2015, this retro speaker is covered with microfiber leather, CNC stainless aluminum alloy Finishing, can match with any interior style, and convenient to take outdoors. [Built-In Battery]: Rechargeable battery allows you to enjoy your music anywhere and anytime. Battery can last up for 10 hours of playtime before it needs to be recharged. Working distance up to 100 feet. [Multi-room Music System via Wifi]: Each Wi-Fi Speaker is part of a whole family of wireless speakers and also systems. If you buy two or more our M4 speaker, you can connect them via your home Wi-Fi and play different music in different room or play the same music in every room. Connect up to 10 speakers. Each speaker can stream L/R channels to create a surround sound experience. Download "GGMM MUSIC" App from your Apple Store/ Google Play to control your speaker through your smart device. Color: ORANGE GGMM M4 - Portable Hi-Fi Wireless Bluetooth / Wi-Fi Speaker FEATURES: 3 Connection Modes -- Wi-Fi Mode, Bluetooth Mode, Auxiliary Mode. Ability to connect up to 16 devices Multi Functions -- Support for Wireless Music Streaming, Multi-Room Play, Left/Right Chanel Set up, connect up to 10 speakers at a time for Multi-Room play Convenient Portability -- Built in Battery that lets you take the M4 speaker where ever you go, allowing for up to 10 hours of music streaming HiFi Stereo Sound Quality --The use of Professional Audio chips increases your Hi-Fi experience and decreases the loss of audio transmission Honorable Product -- 2015 Reddot Award Winner for best design Quality Warranty -- 3 Year Warranty & Free Lifetime Technical Support Package Contents Include: 1 -GGMM M4 Speaker 1 -Power Adapter 1 -3.5mm Aux Cable 1 -Quick Start Guide 1 -Warranty Card 1 - Thank You Card Compatible With: Apple iOS 7.0 and above iTunes 10.1 and above Android 4.0 and above Windows XP/Vista/7/8 & MAC Start with one speaker, and then add more to other rooms with the GGMM M series speaker (M3/M4). Stream the same music to every room, or stream different songs to different rooms wirelessly!